Smartphone brand Infinix is reportedly planning to launch a new color variant of their recent smartphone, the Hot S3. 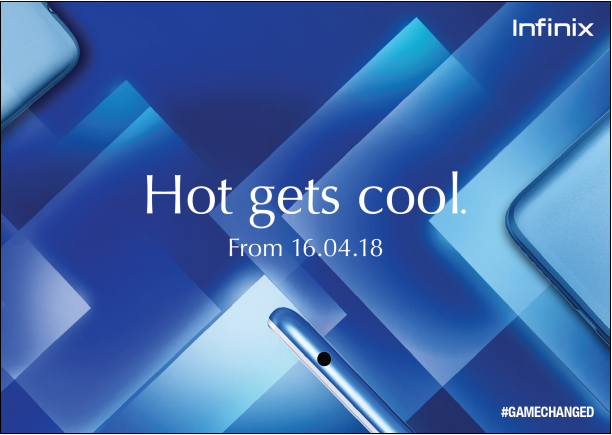 Invites have been sent with a tagline 'Hot gets Cool' with blue background and side profile of a blue colored smartphone. The Hot S3 was launched recently by the company with an eye on the lower end segment which is dominated by Xiaomi now. The Hot S3 has a 5.65 inch HD+ display with 18:9 aspect ratio. There's a 13 MP rear camera and a 20 MP front facing one. The smartphone is running on octa core Snapdragon 430 with memory options of 3GB+32GB and 4GB+64GB available along with dedicated slot for microSD. It comes with XOS 3.0 based on Android Oreo out of the box and powering this all is a big 4000 mAh battery. The 3GB+32GB Hot S3 is currently available on Flipkart at Rs 8,999 and 4GB+64GB is available at Rs 10,999. Color options available are Bordeaux Red, Sandstone Black and Topaz Blue. Though the pricing might not change, Infinix may be launching the new color with only one memory option. Launching a different variant a while after the smartphone gets launched is becoming a trend. Flagship models from Samsung and Apple had either limited edition ones or a different colored variant. Such launches help the companies to keep the hype up and remain in the news for longer period. Even the budget oriented Mi A1 from Xiaomi launched in red color, so the trend is catching on and customers are always fond of options.